Inder Loves Folk Art: Mossy Maritime. Hello readers! I have been busy sewing, and I'm running behind with my blog updates. 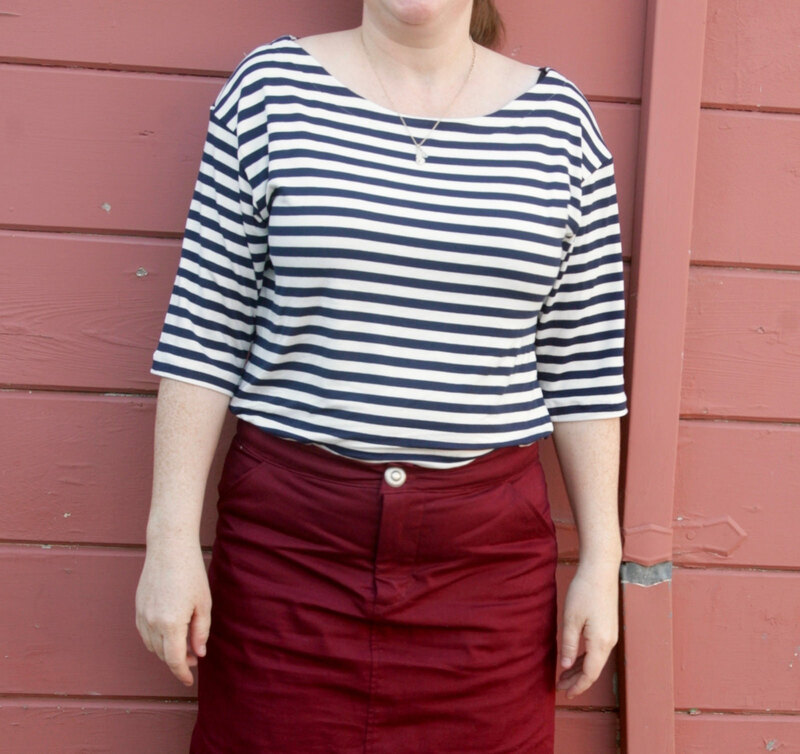 I'm not going to win any awards for photography on this post, but here's a selfish-sewing project I finished last weekend - a Grainline Moss Skirt and a Liesl & Co. Maritime Top. I was a little nervous about fitting this skirt, so this version is a "wearable muslin" using leftovers from another project. This maroon cotton twill is a nice bottom-weight, but picks up an annoying amount of lint and creases a lot, as you can see in these photos. But I didn't want to cut out my first version out of really nice bottom-weight, so I used this for my first skirt. I do really like the color and despite my quibbles with this fabric, expect to wear this skirt a lot! My process of fitting was (as usual, and this is a sad, sad thing) quite inexact. My waist measured as a size 12 but my hips at size 8. I knew that I would need more room around the waist, especially in the front, and that I probably wouldn't need nearly as much fabric around the hips and bottom. So like any really careful, precise seamstress, I totally winged it - I cut out a size 10, but added a little extra width between the hip and waist. After I had constructed the skirt, including the pockets, back yoke, the side seams up to the hip, and the zipper fly, I tried the skirt on inside out, and pinned the side seams to fit. I ended up taking the back yoke in a half inch near the back waist, and pinning out most of the excess fabric on the sides. I think next time I can definitely cut a size 10 with just a half inch extra on the front pieces and a slightly longer waistband. My conservative/sloppy approach worked but I definitely cut this much larger than I needed to! 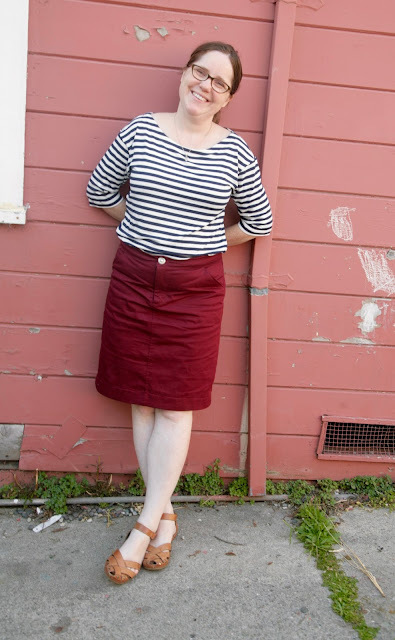 The nice thing about doing a "wearable muslin" is that if I make this skirt again, I can measure the actual skirt to guide the process (yes, yes, I realize I should be making the changes on the flat pattern pieces - do people actually do that?). I used a silver southwesterny button from my stash for the front waistband. 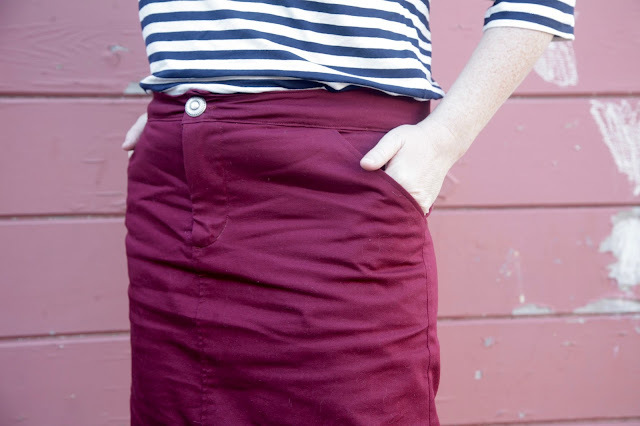 I find that the waistband creases a lot after sitting in this skirt - I'm not sure if a better interfacing would help that? It happens with a lot of RTW clothing too, so perhaps it's just the reality for this style of waistband? Obviously this fabric does tend to crease a lot. I added a LOT of length. The Grainline has two views, a mini skirt (and it is mini, like no way would I wear it as is without leggings underneath) and a longer view with a hem facing. I am only 5'4" so I think I can say objectively that this pattern is SHORT. I decided to lengthen the mini view, but I did it by placing the hem facing next to the main pieces on the fabric and cutting them out with that extra length (seam allowances added to the length as well that way). So this was adding something like five or six inches to the length. Even so, the skirt skimmed my knees and I did not want to fold up a hem, so I made a bias hem facing from the same fabric I lined the pockets with. I love the length now but must admit, the width of the skirt does not allow me to take great strides. Getting off the bus in the morning, which often requires a decent leap from bus to curb, might be a challenge and require some hiking up. So while I love the narrowness of the skirt, I might have to make it more A-line if I want to do this length again in the future. As an aside, I am taking the bus and BART to work now, and I love it. I have an inexplicable love for the bus. I resisted taking the bus for years, thinking it would be a horrible hassle and take much longer than driving, but it's just not a big deal. It comes frequently, picks me up a few blocks from home, and drops me off right at the station. It should be noted that although I live in a big city, the San Francisco Bay Area is not exactly noted for its amazing public transit. But I have an app on my phone with real time updates so I can time my departure from home so as to avoid long waits. And instead of driving and feeling stressed, I can walk and read my book more. It is a surprisingly awesome part of my day and I have been getting back to almost pre-kid levels of reading lately, which is freaking wonderful, people! I had another, harder to articulate and more embarrassing fear, which was that the bus would be "squalid," which I can now see for the ridiculous race/class privilege that it was. Look, at least I am working on it, right? I am recording it here in hopes that others will see and recognize the bias and perhaps take a chance on the bus. I believe that the perception that public transportation is only for the poor and down-and-out is one that was encouraged by the oil companies who transformed California into a car-centric environment back in the 30s and 40s (a fun albeit somewhat controversial piece of California history, see conspiracy theories here) and endorsed by later white-flight suburbanites, and yet the idea persists. I am delighted to report that all sorts of people ride the bus and it's great. I love seeing a sample of the folks who live in my neighborhood and that is one of my favorite parts of the experience. That, and reading my book, of course. Forgive me that digression! Now I will get back to sewing. The top is another pattern I've had in my stash for a long time - the Liesl & Co. Maritime Top. It is a very simple boat neck tee with a faced neckline that has a maritime/French Briton top vibe. The fabric is a lovely, heavy rayon (or bamboo?) navy stripe that I bought from Imagine Gnats a month or two ago which does not appear to be on the website anymore. It was a little bit shifty to cut (and my stripe matching is not great, partially as a result), but feels really nice on. 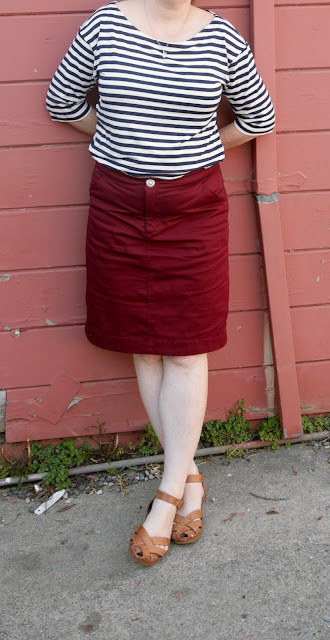 This pattern is the woman's equivalent of the Oliver + S Sailboat Top and it's awesome! I really like the facing around the neckline - it feels substantial and stays put. I must say, I have not been a big fan of the "serge then turn over and stitch" method of finishing necklines that you see in some (quite a few) patterns, at least for me. I feel like the neckline is constantly trying to flip over, especially on curly jerseys (and especially where the neckline is a bit too wide). This faced neckline is a lot more secure. 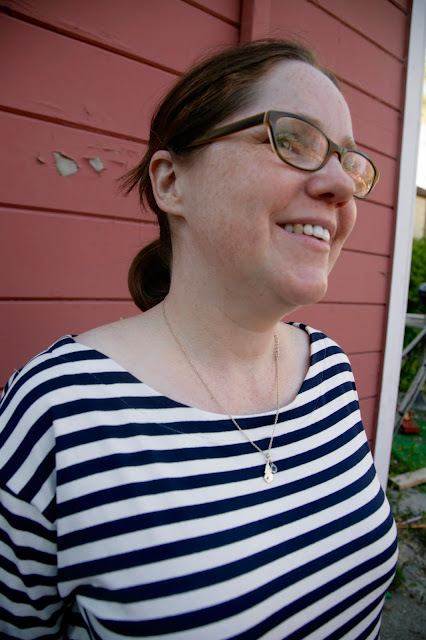 I may start drafting facings for non-bound necklines in knit! Because the neckline is plenty wide, you can use straight-stitch to stitch down the facing because it does not need to stretch a lot to get over your head. The end result feels very stable and comfortable - no worries about what your neckline is doing at any given moment. In other news we are going to be doing some substantial work on our backyard this summer, pulling up the ugly concrete to address some drainage issues (that became especially apparent during this rainy winter) and hopefully improving the function of the space. I finally came to terms with the fact that landscape design is not my thing, and we are hiring a lovely lady to help us come up with a vision for the space - especially to help us create some hardscape areas and seating areas. I am so excited to see what she comes up with! Whatever we end up doing, I promise to post some before/after pictures. And don't worry, the plan will have plenty of room for our vegetable garden, which is already mostly planted up for this year. I have been harvesting greens (arugula, kale, chard, and lettuce) all spring and the tomatoes, peppers, and basil are in the ground. Last year was a terrible drought year and it was not a banner year for the veggie garden, but we did still get tons of peppers and tomatoes. This year I decided to "keep it simple" and grow plants that (a) grow well without much assistance in my climate; and (b) we really like to eat. So nothing fancy, given that we will be making changes around it and doing a lot of work elsewhere. My hope is to really expand on our herb garden, since Mediterranean herbs do so wonderfully in our garden with very little work (makes sense, since we live in a Mediterranean climate, but also they are just tough little plants!). It's fun to have a new project to look forward to! As a pleasant side effect, perhaps I'll have a better backdrop for blog photos? Ha. I could have titled this "Mossy Maritime and Miscellaneous Meanderings," huh? What are you sewing or planting this weekend? Inder, I am in love with this entire outfit. I would wear the heck out of it. The skirt color is fabulous - at once neutral-ish yet unexpected. So I actually did make flat pattern adjustments after my first Moss - and then when I cut the second one it was way too small! Because my first one was made out of a stretchy corduroy and my second out of a totally not-stretchy bottomweight something. Rookie mistake I guess. Also, i had the same crumpling waistband issue with this skirt and wondered whether a higher quality interfacing would fix the problem. However, I have yet to acquire any higher-quality interfacing so I haven't tested my theory. And both my Mosses got tons of wear anyway (past tense - they no longer fit, sob). Finally, I also love the bus. I have not had occasion to ride it in some time, but in my single days as a city gal I used it all the time. I don't think there is the same stigma associated with the DC bus system as it sounds like there may be with the SF bus system - tons of people use it to commute. I am with Masha, I would wear this every day! I have not made this and I am definitely not handing out sewing advice but my waistbands get a curl, not matter how much I interface or shape the waist band, I have a mummy tummy and I assume that is my problem. I have a nice belt that keeps things smooth. No public transport here, Shank's pony or your own car but , wow, the cost of parking for you is terrifying. I used to quite enjoy the bus when I was a teenager at college in the city but I must admit, I have not caught one for 20 years. I love this look! I'm a big fan of deep red pants/skirts/shorts and who doesn't love a stripey top!?! Ooh, yay for taking the bus! I used to take the bus when I was a kid and I loved it. Nowadays, I'm too lazy to figure out how to manage kid-dropping-off-and-picking-up-iness to seriously think about giving up my car for my work commute, though. Your outfit is adorable! What kind of interfacing did you use? Maybe the waistband is just creasing because the button is there? Great outfit, the combo is totally wearable with other things and I'd wear that shirt constantly. Totally with you on mass transit. I used to work downtown and would take the MAX (light rail) into town and the bus home, which just worked logistically. Agree that the reading time and lack of driving was really nice, and though it gets a bad rap here in Portland too, I loved taking public transportation. Definitely had some sketchy dudes try to talk to me, but I developed a pretty good RBF and seating tactics to keep them away. My husband and I rode BART up to the Mission when we visited SF a few years ago and i was freaking out at how fast and awesome it was. Haha. Anyway. Good for you for making it work! I wish i could ride it to my current job! I love this outfit! It looks great on you and zipper flies qualify you for some serious sewing street cred in my book! I loved reading about your experience using mass transit. Our city has an awful bus system. It's shameful for a city of our size. I'm glad you share about these things on your blog. I love reading about it! It's so interesting. You are a very interesting person with a lot of insightful things to say. And this outfit is amazing - as are your sandals - as are you! I love both pieces but I am especially in love with the color of your skirt. Such a great piece! I wish there was decent public transport where I live. There is very little here and really, although I hate to admit it, we live pretty much in the burbs. We have friends who live in a downtown neighborhood and get to take the trolley everywhere (not a real trolley, but a bus made to look like one- ha!). Anyway, I think public transport is great. I went abroad for a year in college and loved not having a car but being able to get around by bus/train. This is such a great outfit, Inder. 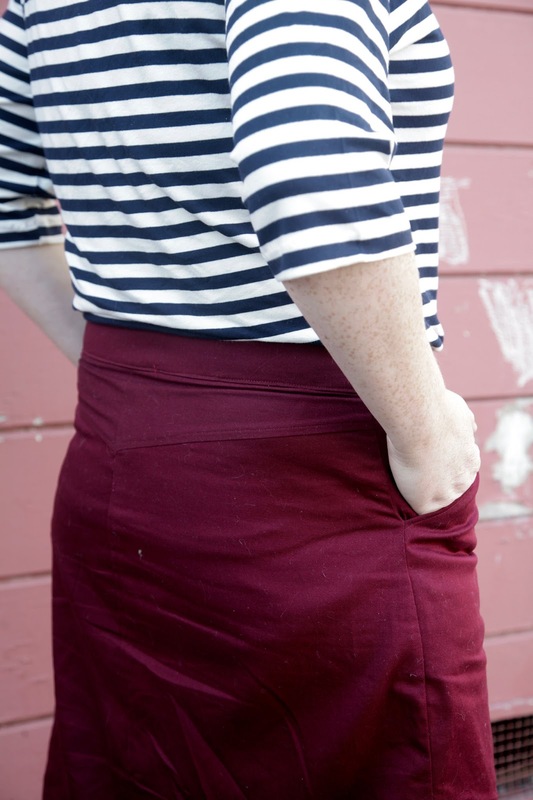 I love the striped top with the maroon skirt. There is just something so great about a striped boat neck tee. I feel like I need one for every day of the week!